I suppose it was not very nice of me to share this image the day the Associated Press declared Hillary Clinton the presumptive Democratic nominee. Many of my fellow supporters of Bernie Sanders have invested so much of their time and energy into trying to help him win the nomination. Obviously, disappointment is going to be tough to swallow. It is going to take some time to come to terms with the outcome of this primary. I probably should have at least waited a few days. I have been struggling lately with the level of denial among many Sanders' supporters. No matter what the numbers say, I see many on Facebook and Twitter still insisting not just that he can win but that he will win the nomination. I admire their dedication to the cause, but I worry about how hard reality is going to hit when it does hit. 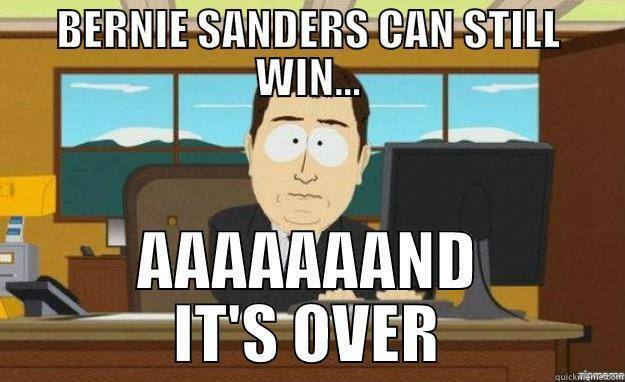 Once Clinton is officially the nominee and Sanders has conceded and endorsed her, how are they going to go on? I can't figure out if they really believe Sanders is going to win the nomination (which seems almost delusional) or if it is more a matter of deliberately pretending that he still has a realistic chance in order to stimulate voter turnout in the last states to vote. In any case, it seems like now would be an appropriate time to begin what is likely to be a slow process of allowing reality to penetrate one's force field and sink in a bit. I wanted Sanders to win the nomination too. Unfortunately, wanting something does not mean it is going to happen. It does not work for religious belief, and it does not work for political desire. If Sanders wants to stay in all the way to the convention, it is his right to do so. If he thinks such an approach will maximize the influence of the movement he has created, let him do so. He might even prove to be right. As flawed a candidate as Clinton is, I really don't think that Sanders staying in a bit longer is going to do additional damage to her. She's shown herself to be perfectly capable of doing that on her own.